Healthy and Easy Maple Peanut Butter Pecan Oatmeal Bars make the perfect healthy treat. 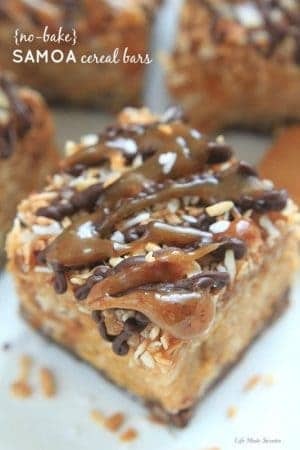 Soft baked gluten free oatmeal bars made with peanut butter, pecans and dates with a peanut butter drizzle. Vegan and refined sugar free. In my world, there is nothing cozier than a hot bowl of oatmeal with a splash of of maple syrup on a chilly fall morning. Throw in a spoonful of peanut butter and you’ve got one amazing combination. These Maple Peanut Butter Oatmeal Pecan Bars are soft and full of texture loaded in every bite. The delightful crunch comes from the rolled oats and chopped pecans. They are everything I love about my ideal autumn flavored oatmeal in easy and convenient portable bars. Plus they contain NO butter or refined sugar and are a little more healthy and wholesome with the oat flour, coconut oil and peanut butter. If you can’t find oat flour, you can make your own and grind it up in a food processor or sub with your favorite all purpose or white whole wheat flour. They’re also not cloyingly sweet having just a touch of maple syrup and a naturally sweet and chewy date center that resembles a gooey caramel filling. 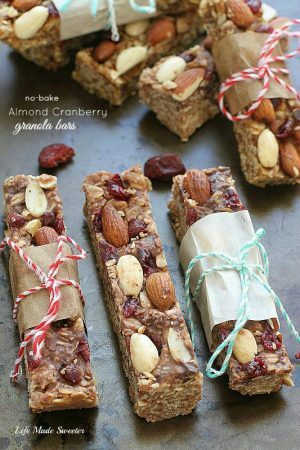 They sort of remind me of a soft-baked version of my No-Bake Granola Bars which are a popular favorite around here and we usually like to keep them stored in the fridge since they tend to soften up slightly when left out at room temperature too long. You can enjoy them for an after workout snack or stash them in your lunchbox to go. Either way, they make a satisfying and healthy breakfast or anytime snack that the entire family will love! Soft and chewy baked oatmeal bars made with maple peanut butter, pecans and dates with a peanut butter drizzle. Best part of all -- no butter or refined sugar! Preheat oven to 350 F degrees. Line an 8 x 8 square baking pan with parchment paper leaving a slight overhang on the edges for easier removal. To make the date filling - In a small saucepan over medium high heat, combine the dates and water. Cook and stir until mixture comes to a boil, mashing down with a spoon.. Reduce heat; and continue mashing down while stirring constantly about 2 minutes or until mixture is thickened. Remove from heat and stir in 2 tablespoons of peanut butter until combined. Set aside. To make the oatmeal bars - Mix flax egg in a small bowl or mug and set aside to thicken. In a medium microwaveable bowl, heat coconut oil on high for 20 seconds. Remove from microwave and whisk in peanut butter until smooth. Add vanilla and maple syrup. Stir in flax egg and 2 tablespoons of prepared date paste and mix until combined. Set aside. Leave the remaining date paste for filling the oatmeal bars. In a large bowl, combine the oats, flour, coconut sugar, baking soda and salt. Pour in the melted coconut oil/peanut butter mixture and stir until combined and thick. Pat half of the mixture into the prepared pan - pressing down firmly and spread flat with offset spatula. Spread date mixture on top evenly with an offset spatula then sprinkle chopped pecans over. Gently pat remaining oat mixture over date mixture. **Optional - Sprinkle an additional 1 teaspoon rolled oats evenly on top for added texture. Bake in preheated oven for 20-22 minutes or until lightly browned. Remove from the oven and allow to completely cool. You can speed up the cooling process by putting the pan in the fridge if needed. Cut into square bars. 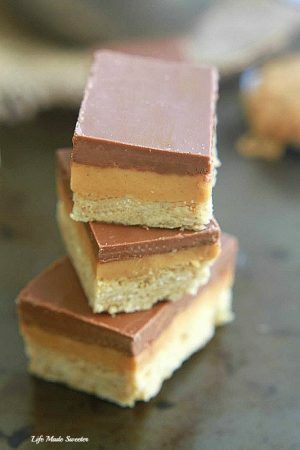 Optional topping: Top each square with a small dollop of peanut butter in the center, place whole pecan on top and drizzle melted peanut butter or chocolate over each square. Best if stored in fridge. They will be slightly softer if stored at room temperature.